Trevor Noah shares his story of growing up in South Africa, with a black South African mother and a white European fat The host of The Daily Show, Trevor Noah, tells the story of growing up half black, half white in South Africa under and after apartheid in this young readers' adaptation of his bestselling adult memoir Born a Crime: Stories from a South African Childhood. To ask other readers questions about It's Trevor Noah, please sign up. What age group is this young readers' edition aimed at? I went into this really hesitant because I’ve read the adult version and it was explicit and mature. However, they did a fantastic job paring down the content that was too mature without sacrificing the story. I would recommend it for grades 5 and up. This is a wonderful introduction to life in South Africa towards the end of Apartheid. Trevor honestly and humorously tells his personal story through the frame of the country’s history. I received a copy of this book direct from the publisher in exchange for an honest review. It’s Trevor Noah: Born A Crime (Young Readers Edition) was given to me for free by Random House Kids. Thank you for giving me the opportunity to share Trevor Noah’s incredible memoir in an age-appropriate way with my middle school daughters! Mr. Noah’s life experiences in South Africa are delivered with the same honesty and witty humor as the original. In the editing process any profanity or adult themes were removed, leaving this version as delightful as the first! 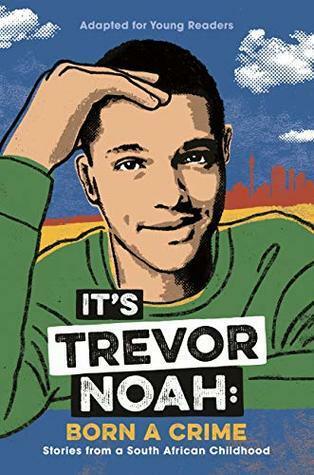 Noah’s well told narrative as It’s Trevor Noah: Born A Crime (Young Readers Edition) was given to me for free by Random House Kids. Thank you for giving me the opportunity to share Trevor Noah’s incredible memoir in an age-appropriate way with my middle school daughters! Mr. Noah’s life experiences in South Africa are delivered with the same honesty and witty humor as the original. In the editing process any profanity or adult themes were removed, leaving this version as delightful as the first! Noah’s well told narrative as a young person growing up in South Africa is fascinating. Within, he details his life under Apartheid rule, the repercussions of colonialism (his father is Swiss German and his mother is Xhosa), and the unique racism he experiences due to his mixed race. Noah’s colorful accounts are told in an easily understandable way and with a warmth of speech, all the while still conveying their significance. Other trials of Noah’s life, such as his abusive stepfather, extreme poverty, and even flirtations with crime, engage the reader with his narrative tone. Sprinkled throughout in an even more playful voice, are the universal struggles of childhood and coming of age, as well as hilarious episodes of Noah’s wildly mischievous side that had us laughing out loud time and time again! It is obvious throughout this memoir, that Noah’s mother is the real hero of his life. Patricia is an incredibly strong woman who never made excuses and was determined to give her son what she had not. And though I’m speaking of some major things such as housing and education, I’m mostly referring to the gifts of discipline, perseverance, a willingness to buck the system even as it tried to oppress them, and most of all, unconditional love. This marvelous memoir brought discussions of colonialism, racism and oppression full circle in our homeschool since we’re currently studying early U.S. history. All said, this wonderful memoir gave my children such a unique and vivid lens with which to look at a childhood very different from their own. I chose It’s Trevor Noah: Born a Crime because the title was intriguing to me, and I wanted to learn more about the term “apartheid”. I had to search for apartheid and I learned that it’s another word for a police system of segregation or discrimination in South Africa. I wondered what the differences were between the apartheid and racial segregation in the United States. Trevor Noah provided an autobiographical account of what it was like to grow up in South Africa during the apartheid. Trevor I chose It’s Trevor Noah: Born a Crime because the title was intriguing to me, and I wanted to learn more about the term “apartheid”. I had to search for apartheid and I learned that it’s another word for a police system of segregation or discrimination in South Africa. I wondered what the differences were between the apartheid and racial segregation in the United States. Trevor Noah provided an autobiographical account of what it was like to grow up in South Africa during the apartheid. Trevor wasn’t really black, but he also wasn’t white, he just had really light skin. Trevor Noah grew up in South Africa during apartheid, as a biracial boy. His mom was black and his dad was white. When he was with his mom, he was identified as a white child, and when he was with his dad, he was considered to be black. Noah struggled early on in life with his identity and was often bullied for the color of his skin. It’s Trevor Noah: Born a Crime goes into a lot of detail about growing up in a society where poverty ruled and racism oppressed blacks living in South Africa. Blacks were often arrested if they rebelled against the unjust laws. Trevor’s mom was rebellious to the point where she took a job as a typist, and she had learned how to type at a time when it was unusual for black women to perform any job outside of menial position. His parents were divorced, and his dad did not influence his life, as he moved to Cape Town. The title, Born a Crime, reflects how his parents were not supposed to have a mixed child, and they never should have married. I liked how Noah provided a sense of humor in each character, and threw some violent language into the story, which made it more interesting and realistic. Noah did a great job of breaking down his childhood and his young adult years to the readers and gave a great example of what it was like growing up in South Africa during apartheid. Noah also made the story more humorous by showing us how he was constantly a failure in life, and couldn’t do anything right. This was relatable to growing up as a teenager. I thought that maybe Noah could have added more information about the people around him, but the reader learns the devastating effects of domestic violence and how it tears apart families. Despite all Trevor went through living in apartheid South Africa, he managed to get through those hard times and come out as a positive and successful person. Trevor Noah revealed his past growing up in South Africa. The book explains an entirely different culture influenced and fused with American culture. Growing up in a racist society Trevor faced many struggles of fitting in and just being a kid. The book was well written as it was easy for the reader to connect with Trevor and his troubled past. This book not only gives you insight into a Trevor Noah, but also South African apartheid. I definitely want to read more on the subject. Stories about Trevor and his mom teach you about their culture and the adversities they had to overcome. I would recommend this book to anyone. Entertaining, eye-opening read about racism, religion, and love. GREAT read! Much less edgy (see: explicit) with regard to the mature parts of the adult edition. The context is there, the content is simply edited for language, detail and other non-age-appropriate themes. Great for readers who want to learn more about Apartheid and the life of Trevor Noah. Recommended for both teens and parent-aged readers alike.